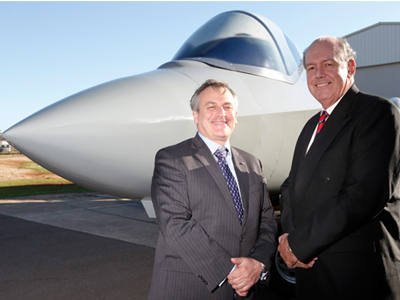 Chief Defence Scientist Dr Alex Zelinsky (left) with Senator the Honourable David Johnston, Minister for Defence in front of the F-35 Iron Bird at the unveiling ceremony. Minister for Defence Senator David Johnston this month commissioned research on a full-scale replica of the F-35 Joint Strike Fighter (JSF) built by DSTO to study the effects of electromagnetic compatibility and interference on the aircraft’s electronic systems. The model called Iron Bird will be tested under simulated electromagnetic conditions during the acquisition and through-life sustainment of the JSF. The US JSF program office asked DSTO to undertake this research based on its world class expertise in investigating electromagnetic environmental effects on aircraft. DSTO’s lead scientist on the program, Andrew Walters, said all aircraft in flight are exposed to electromagnetic (EM) radiation arising from natural and human sources including lightning, static discharge, telecommunications and radars. “This exposure can interfere with aircraft communications and sensor systems, cockpit displays and even flight control functions, which can impair the performance and safety of an aircraft and its crew,” he explained. Senator Johnston said the DSTO test methods provide a rapid, cost-effective means of assessing and monitoring the JSF’s ability to withstand electromagnetic exposure and minimise any impact on its systems and performance. The Australian Government recently committed to buying an additional 58 JSF aircraft, bringing the fleet total to 72 aircraft. Australia’s first two JSF or F-35As are due to be delivered to a United States-based training facility during 2014-15 when Royal Australian Air Force (RAAF) pilot and maintainer training will begin on the aircraft.